My hydrangea bush is doing great this year, probably because it’s on the side of the house that is now a dog run and every day I empty the dog’s water bowl on the bush. Also it’s no longer competing with its two siblings that I removed because one never blossomed and the other had annoying teensy flowers that shed all over the table. As I noted in my journal above, drawing a fan seemed like it would be even more boring than drawing the remotes but in fact it was really fun. I was really surprised as I sketch to discover all kinds of interesting design features I’d never noticed before when just turning it on or off (without the using the remote that came with it, which I’ve lost). So I didn’t make it to every day in May, just 75% of them. I went away for a 3 day retreat and when I came back had lost the momentum. Oh well. During days of dismay at my disappointingly dismal drawing dexterity I determined to draw ’til I improved. But I was under the influence of migraine medicine which fixed the headache but left me drowsy. I actually fell asleep at the drawing table, dropped my brush on the page which woke me up, and had to go lie down for a spell between drawings. 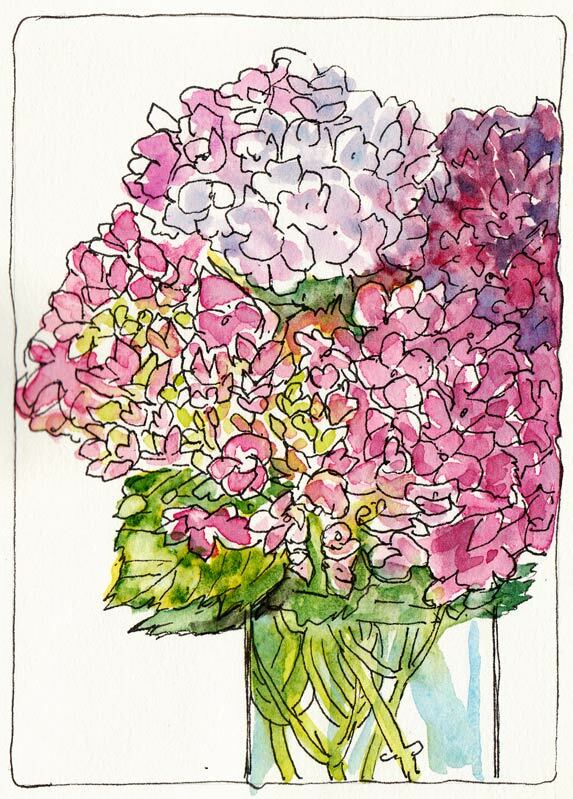 My hydrangeas are bursting with vibrant blooms so I made them my subject. The first attempt got off to a decent start until I painted a nearly black background, probably due to my really dark mood and being too doped up to know when to stop. I couldn’t stand the way it looked, so before scanning tonight took a soft, wet sponge and washed off the dark background. Then I dropped a little more color into the wet background. 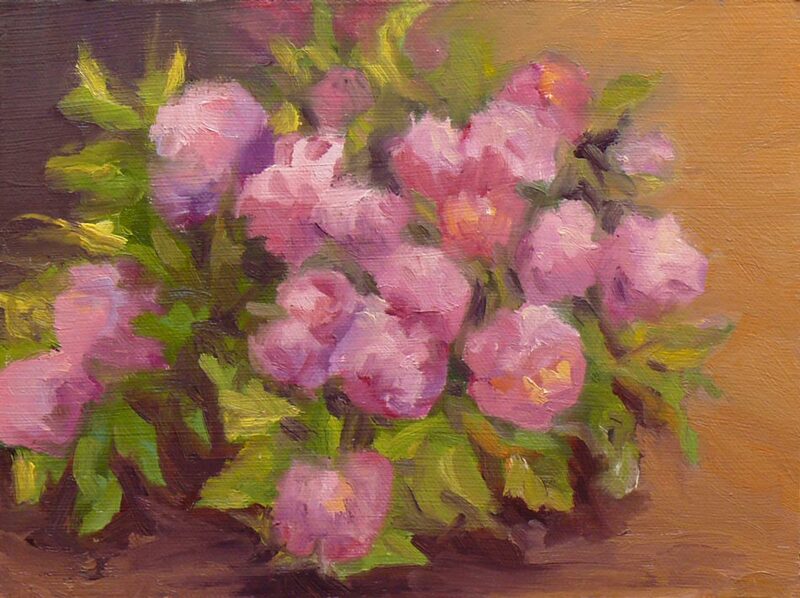 I had the most fun with this last attempt, where I drew and painted more loosely, trying to capture the flavor and personality of the flowers. We had a sunny day after months of rain, so I took a walk around my garden. 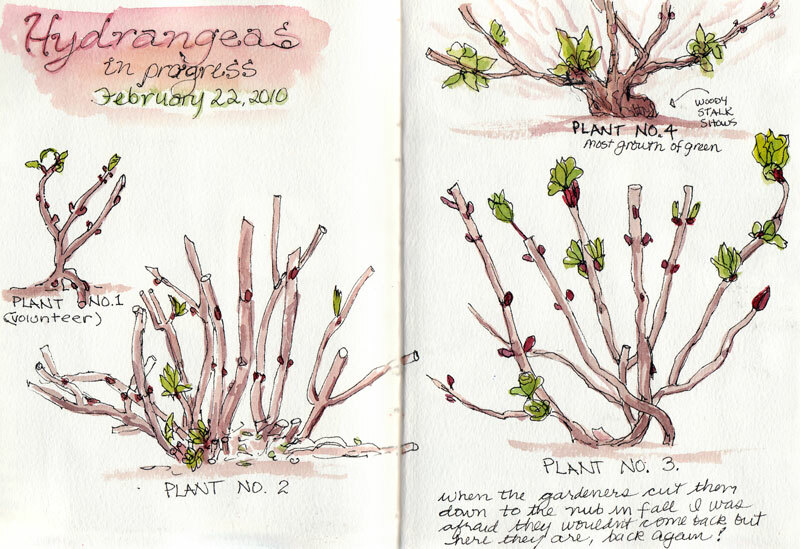 I was happy to see the hydrangeas coming back after having been cut down to little woody stalks. The three I’d planted after the comical hydrangea planting fiasco were all sprouting and there was a new one, a volunteer that appeared on its own volition. And I too feel cut down to my woody stems, stretched thin by all I try to do. So I’ve been thinking about who I am as an artist, who I want to be, what work brings me the most joy or the most suffering, my artistic strengths and weaknesses, and how I can make the time I spend on art as satisfying as possible. I’m so grateful for artist friends like Barbara and my sister, who are good listeners and understand the challenge of having so many (too many?) interests and artistic pursuits to follow. Or, as Barbara writes, we’re “Never Bored” (or “Never B-ed” as she spelled it, for reasons she explains in her blog post). 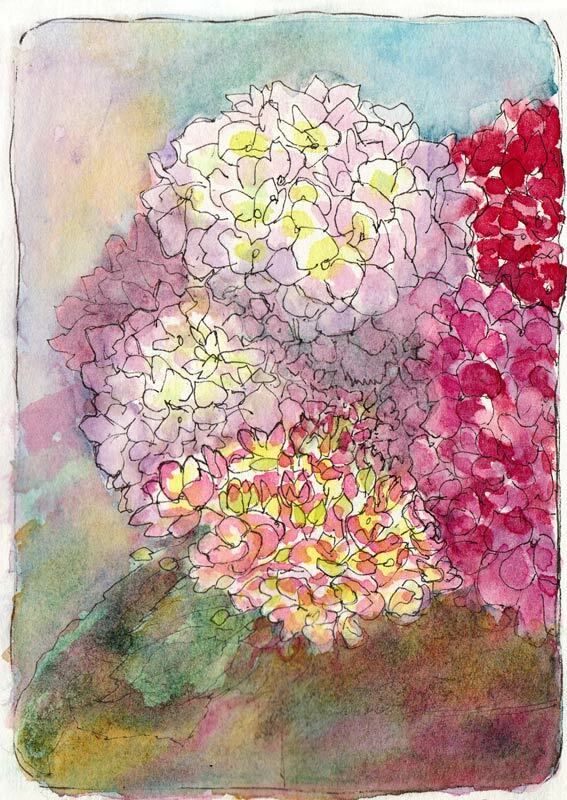 And like my hydrangeas, some good ideas are starting to bud and bloom about how I can nurture my most rewarding art pursuits now, while putting off or letting go of the others until more of my time is my own. 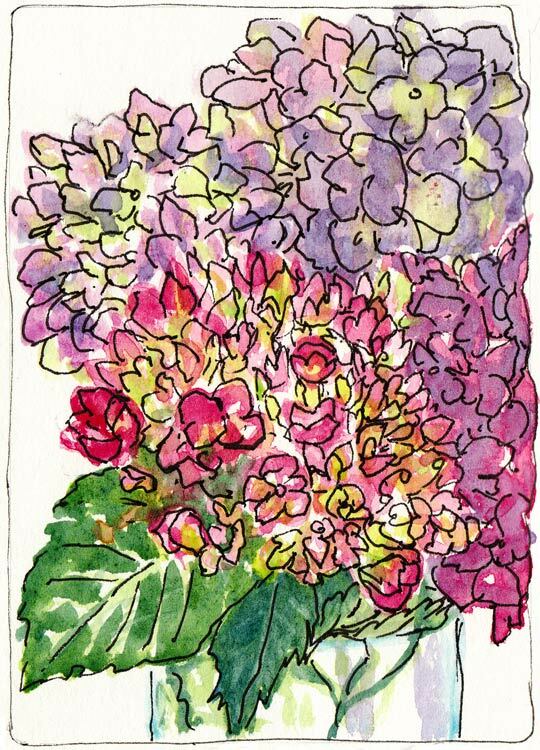 It felt so good to get outside and paint this sunny afternoon, even if it was only for an hour on the side of my house by my trash cans where this small hydrangea is finally starting to blossom and grow. This week I’ve been mucking about in the studio trying to fix the compositional problems with my painting of the ladies at the farmer market. Today I gave up on it and moved on. The struggles I had with it were a good reminder for me about how important it is to resolve compositional issues before starting to paint (like the area where you couldn’t tell hands from plastic bag from shopping cart handle). Also a good lesson that if a painting’s initial framework isn’t working, it’s better to start over than to spend hours and hours trying to fix it. Although I really liked many parts of that painting, it just wasn’t working as a whole. My sister and I joined my vibrant and adorable 87 year old aunt and her two sons (our cousins) who I hadn’t seen for 30 years for lunch today. It was so inspiring to see how youthful my aunt is — she drives, goes bowling with her girlfriends, and takes long walks several times a day with her Border Collie.